The Los Angeles Municipal Art Gallery is located in Barnsdall Art Park in Los Angeles. We encourage visitors to cycle, rideshare and take public transportation to the gallery. Cyclists can plan their route using LADOT Dash or Metro bike maps. Bicycle racks are located near the accessible parking spaces across from the Hollyhock House driveway. Barnsdall Art Park is served by the Hollywood Clockwise and Hollywood Counterclockwise Dash Route. Dash bus stop: Vermont and Hollywood. See LADOT Dash for the Dash route map. The nearest subway stop is the Vermont/Sunset stop on the Metro Red Line. 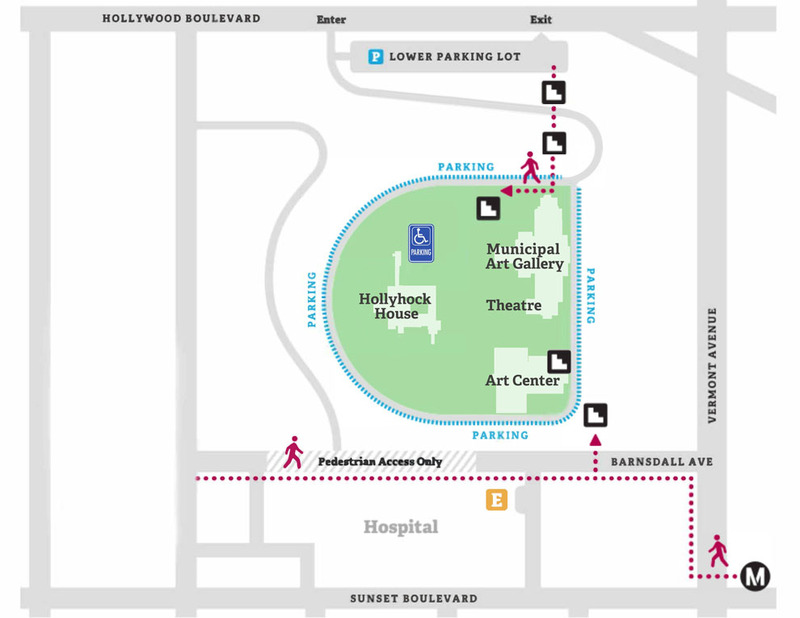 From the station, walk north on Vermont Avenue towards Hollywood Boulevard, turn left onto Barnsdall Avenue and enter through the Southeast entrance. Metro 754 on Vermont and 780 on Hollywood all stop within half a block of Barnsdall. See the Metro website for bus and subway maps. Cars can access Barnsdall Art Park via the Lower Road on Hollywood Boulevard. Parking is free but limited and can be found in Barnsdall Park at the top and the bottom of the hill. Parking is found at the top of the hill at the Hollyhock House motor court for those with limited mobility. Additional accessible parking is located in front of the Junior Art Center. Visitors are welcome to take photos – please tag us in your photos #LAMAGBarnsdall. Flash photography, tripods or selfie sticks are not permitted. Large bags, pets, food and drink are not allowed inside the gallery. Tours, school and group visits are available upon request for groups of fifteen or more. Workshops for school and youth groups are also available. We can accommodate up to fifty students for a two hour program that includes a gallery tour and art workshop. The tour introduces key concepts in contemporary art, and applies critical thinking and observation skills to the works of art on exhibitions. The workshop provides hands-on lessons and art making inspired by the ideas and approaches found in the works on exhibition. Educators can prepare for their visit by downloading the Educator’s Guide for our current exhibitions here. For details and scheduling, contact Steven Wong at steven.wong@lacity.org. LAMAG encourages families and visitors of all ages to experience our exhibitions with the goal of inspiring rich inter-generational discussions. For each exhibition, LAMAG develops a Family Guide, which includes key concepts and activities families can engage in for a more meaningful gallery experience. To prepare for your visit, you can download the Family Guide here. Accommodations may be provided upon request. To ensure availability, please make your request at least seventy two hours prior to your visit. To secure Sign Language Interpreters, five or more business days’ notice is required. For additional information, please contact Steven Wong at steven.wong@lacity.org.